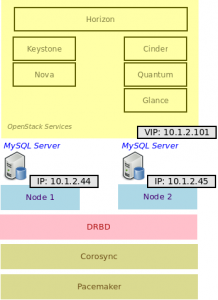 After that just you can begin the setup of OpenStack and OpenShift. You’ll need an installation of VirtualBox and Vagrant. There’s some gotchas, so look at the known issues in the README, specific to OpenStack. Otherwise, open your web browser at: http://10.10.10.51. Once done open your web browser at: https://10.10.10.53/console/applications. There more info in the README. In the next post we’ll look at getting OpenShift running on OpenStack, quickly and fast using two approaches, direct with puppet and using Heat orchestration. Fig. 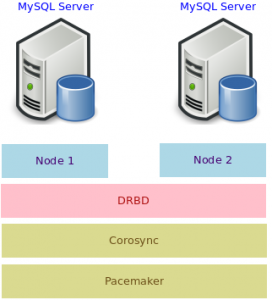 1: Redundant MySQL Server nodes using Pacemaker, Corosync and DRBD. If automation is required, Vagrant and Puppet seem to be the most adequate tools to implement it. What about automatic installation of High Availability database servers? As part of our Cloud Dependability efforts, the ICCLab works on automatic installation of High Availability systems. One such HA system is a MySQL Server – combined with DRBD, Corosync and Pacemaker. 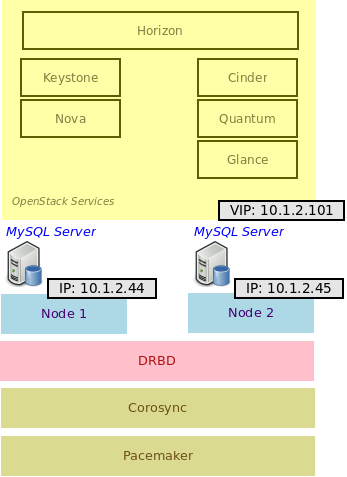 In this system the server-logic of the MySQL Server runs locally on different virtual machine nodes, while all database files are stored on a clustered DRBD-device which is distributed on all the nodes. The DRBD resource is used by Corosync which acts as resource layer for Pacemaker. If one of the nodes fails, Pacemaker automagically restarts the MySQL server on another node and synchronizes the data on the DRBD device. This combined DRBD and Pacemaker approach is best practice in the IT industry. At ICCLab we have developed an automatic installation script which creates 2 virtual machines and configures MySQL, DRBD, Corosync and Pacemaker on both machines. The automated installation script can be downloaded from Github. Please feel free to install it on your machine and test the new release. There is always room to test different HA technologies in a simulated VM environment. At ICCLab we have created such a DRBD test environment for PostgreSQL databases. This environment is now available on Github. The test environment installation uses Vagrant as tool to install VMs, Virtualbox as VM runtime environment and Puppet as VM configurator. It includes a Vagrant installation script (usually called a “Vagrantfile”) which sets up two virtual machines which run a clustered highly available PostgreSQL database. It creates two virtual machines with 1 GB RAM, one 80 GB harddrive and an extra 5 GB harddrive (which is used as DRBD device). It creates an SSH tunnel between the two VM nodes which is used for DRBD synchronization. It installs, configures and runs the DRBD device on both machines. It installs, configures and runs Corosync and Pacemaker on both machines. It creates a distributed PostgreSQL database which runs on the DRBD device and which is managed by the Corosync/Pacemaker software.